Nasty weather meant some fair delays in prep and warmup, as a result I was only able to get in 1 kilometre before marshalling for the start. The start was into the rain. Bitching could be heard from those running full carbon wheels that they’d have no brakes, at least you barely need them in a race. The start was sedate, likely everyone without rollers or a trainer was getting their warmup in during the first 5km. 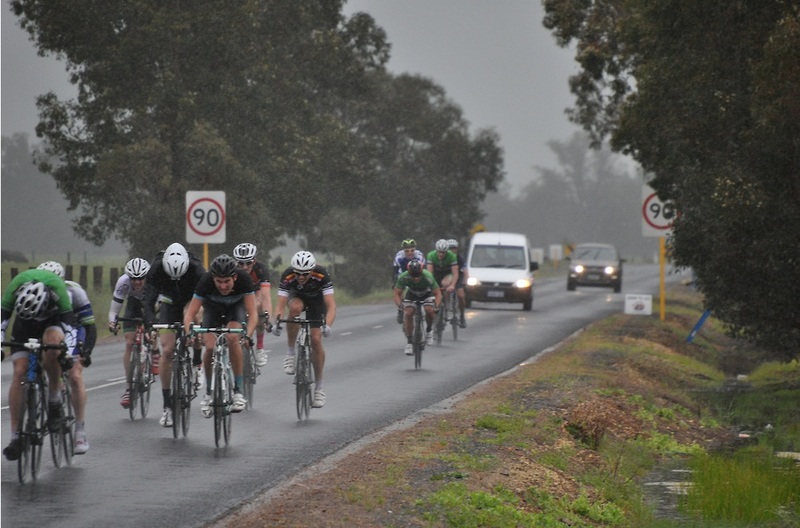 An early breakaway of 8 formed within the first 10km while I was napping at the back of the bunch. No use crying over spilled milk, I resolved to attack on the days biggest climb with encouragement from Pete. After a few small rollers I see what I figure to be the base of the hill at about 15km in. I positioned myself about 6 back from the front of the bunch, waited until we hit the ramp and then after about 20m I dug in and broke off around the right of the pack. I hunched low and far forward, settling into a climbing rhythm after I’d established a gap, 5 minutes of hard work later I’d consolidated and I was happy with my solo breakaway. Not long after the big tragedy of the day would strike, my glasses fell off and I quickly decided to abandon them to hold my break. Little did I know what a hazard and pain that would become (folks, you need glasses in the rain!). So my attack had stuck and I managed to pass the KOM point solo with plenty of room to spare, although I was passed by Michael Vreeken of KD Cycles on his own strong solo attack. Things started to flatten out then meander downhill and the group behind me became motivated and organised, chasing me down after about 20 or so minutes off the front. In the end I was happy to be bridged back in as I had only caught sparing glances of the motivated breakaway ahead and had failed to make my own bridge. It steeled me to see a bunch of my team mates lead the bridge and order me to take a rest. The result of the attack and chase was that about 15 people had been dropped over the climb, it could have only been better if I’d made it over to the breakaway. After a quick breather at the back of the bunch, we rallied and started rolling through to bridge the breakaway and rounded up Vreeken. We caught the breakaway somewhere around the 30km mark and after an awkward pass on a four wheel drive that was following them, I bridged in. Now we’d find they’d become a group of 6, Alex Vukovich and Thomas Bruins having attacked them and broken away as a pair and weren’t even in sight. Everyone gets motivated and starts taking turns to catch the guys off the front. Soon the road would turn down proper for the descent and I’d discover why I shouldn’t have abandoned my glasses. We turn into the wind and downhill, reaching up to about 70km/h, moving in formation. 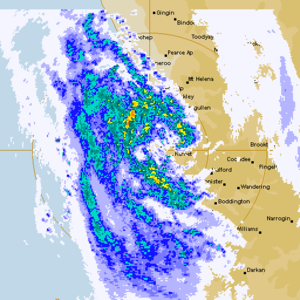 The rain, wind and tyre spray is absolutely battering me. My eyes are in pain and visibility is near non-existent. I would come to the point where I was almost physically unable to open my eyes 5mm to get a peak up ahead, my fear goes through the roof and I death grip my bars; struggling to convince myself I can manoeuvre with any level of safety under these conditions. Just short of concluding it might be fatally stupid to continue, I realised that while not ideal, I could see enough to move safely if I tilted me head down. I was able to keep contact with the group until the pace dropped and I could see better. 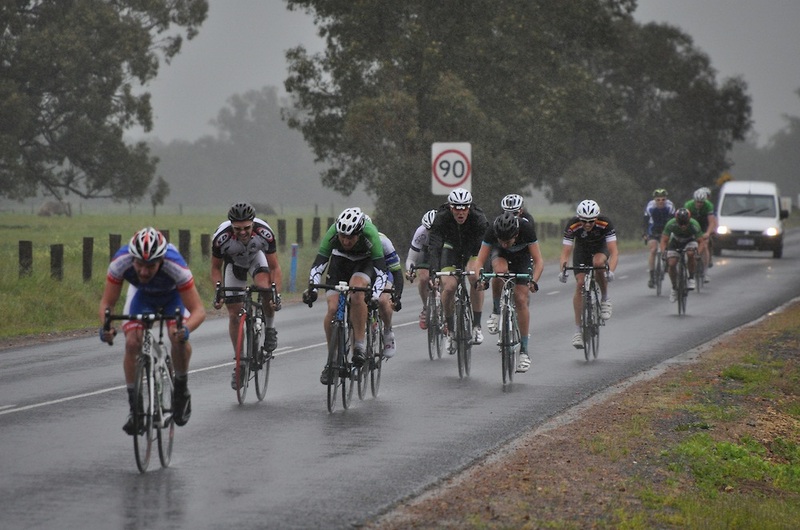 The final 20-30km of the 69km classic would see numerous attacks, counters and foxing. The turnaround point for the final leg in to Pinjarra swung is into a crosswind which predictably resulted in a bunch of guys taking digs at breaking away. They were all reeled back in. 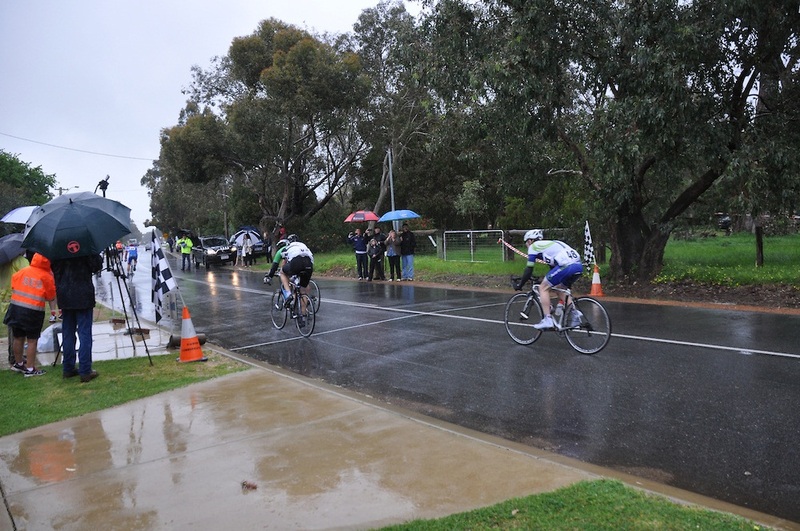 Myself and Michael took a crack at a two man breakaway in the last 4km, we got 1.5km before being hauled back in. By now the pace had really heated up over the final 10km with most of the bunch seemingly determined on forcing a sprint. I settle and catch my breath, holding a few wheels back and defending my bunch position so that I can contend. As soon as we passed the 500m mark, a couple of simultaneous attacks and quick counters go off the front. I grab a wheel to tow me forward. I lose the wheel as a few get away, someone from Avanti grabs mine and I have my own personal battle with Michael. I’m the jolly green giant up front. I dropped the guy from Avanti and Matt from SPR grabbed my wheel for a launch for the line. As Alex and TB had stayed away, we’re sprinting for third and Matt managed to pull 4th, 9 hundredths of a second behind Nick Lawler. I manage 9/38 finishers. I’m pretty happy with this result for my second outing in B grade on a day where I wasted a lot of energy and endured blinding by the elements.